Brain Games: Chess Game Review - Download and Play Free Version! Large range of computer opponent difficulty levels. Famous matches are entertaining to watch and can give you ideas of how to play. If you've ever thought about learning the great game of chess, now is the time! Brain Games Chess comes with enhanced game tutorials just for you. Maybe you already know the rules and consider yourself a skilled player? Either way, Brain Games Chess comes with 12 built-in computer opponents of varying difficulty levels to play against, from Pea Brain, Rookie and Average Joe to Teacher's Pet, Smarty Pants, and all the way to Mastermind! Start at your level and work your way up! Provides a great workout for the brain! Looking for more out of a game? Fun and challenging, Brain Games Chess will put your mind to the test. You have the option to set up the starting board any way you want, so that you can learn to solve any chess scenario found in a newspaper or anywhere else! Customize your computer opponent's skill level in a number of categories, or play against a friend. Play with fire and ice, crystal, cartoon, figurine, or any of 11 other styles to liven up the game! You have many other options to choose from too. Some affect gameplay and some are just plain fun! Turn the comprehensive sound effects of Brain Games Chess on or off, or listen to your own music while playing. Piece sliding animation, shadows, different ways to move the pieces, and different options for timing the game are all available to you. As it that's not enough, you can also watch over 3000 classic chess matches between Grandmasters throughout the 20th century! 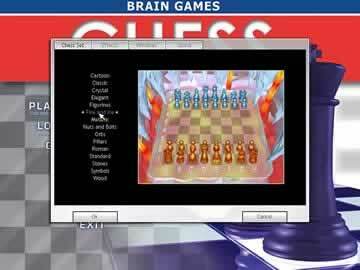 Brain Games Chess provides you with the complete chess-playing experience. 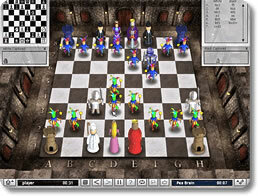 Brain Games: Chess provides an excellent in depth chess experience. You can learn how to play chess or even hone your skills if you are a master player. Everyone from absolute beginner to seasoned pro will be able to find a challenge in this game. The 3D chess board will make you feel like you really have a chess board in front of you. This game is played with the normal rules of chess. Lower difficulties allow you to undo moves as you are learning. Hints and tips can also be turned on if you need assistance. There are hints as to which move you should make, where any particular piece can move and what pieces are in danger of being captured. You can also adjust the appearance of the chess board and pieces. There are traditional style, rock, metal and even figurines that look like people instead of the normal symbol style pieces. There are a variety of levels of computer opponents to play against. They range from Pea Brain all the way up to Mastermind. Each level gives you the IQ of the computer and various statistics on the play style. Things like defense and carelessness will let you know how well you can do against the computer. The lowest difficulty computer will make moves that are completely random and accomplish nothing while also throwing in strategic moves. Another great learning tool for this game is the classic chess matches. Many matches that have been played by professionals can be watched on the screen as the pieces move as they did in the match. While playing, all the information that you could need is shown in various boxes. The moves list is shown as well as the captured pieces. If you just want to have a bit of fun, you can set up the pieces however you want and play from that point. You can also choose what pieces you want to play with, so if you want to play with all queens you can make that happen. The game really only has one major flaw. The orientation of the camera for the 3D board can make it difficult to see the pieces in play. The smaller pieces can be blocked by larger pieces behind them and it is also very difficult to grab them. To see the location of the pieces there is a 2D board in the upper left corner. This is nice to see the pieces but it would also be nice to be able to rotate the camera. 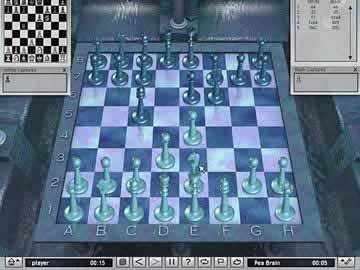 Brain Games: Chess brings all the strategic elements of chess to your computer. With the large variety of computer opponents, players of any skill level will be able to learn and play. Tutorials, classic matches and custom setup games are just a few of the tools that will help you become the best chess player you can be. All ages will enjoy this great game.